We decided to try the Mushroom Pasta from Ohio City Pasta. I was very sad not to be able to save any for our Daughter-in-law Tionna as I am sure this would be her favorite of all the dishes we make. 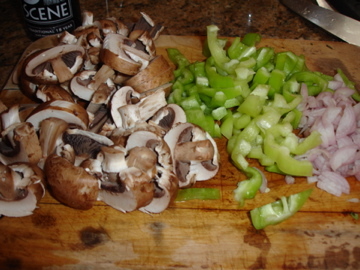 I diced a shallot, sliced some mushrooms and a couple of peppers from our deck, a cubanelle and a yellow Gypsy hybrid. I sautéed these in olive oil and tossed them over the pasta. 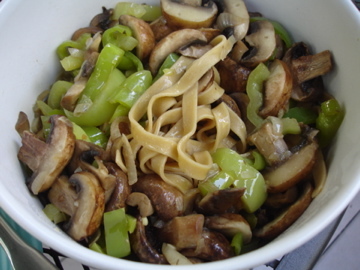 If you are a fan of Mushrooms as I know Tionna is, this pasta is fantastic. 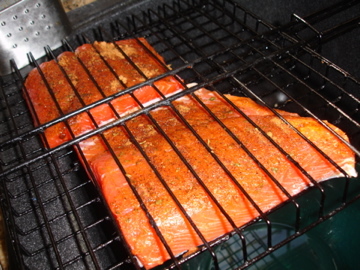 Salmon on the grill is one of my favorite dishes. This time I rubbed the salmon with some olive oil and a lime chipotle rub that my irritating wonderful sister in-law Beth got me for Christmas. It is by Wildtree Herbs and I have to say it is really good. I have read a little about Wildtree and their marketing is a little shaky but the product really is great. I use a grill basket for fish and grilled this on high heat while the greens were cooking. The greens were a combination of beet greens one of my favorites and a member of the Brassica family that we bought at the farmers market but really are not sure what it is. I tossed the greens with a little red wine vinegar and salt. 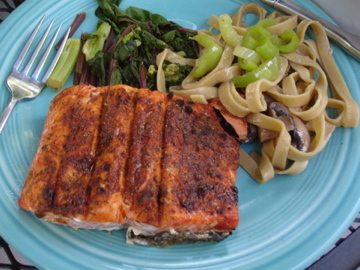 This entry was posted in Dinner, Grilling, Recipe on August 2, 2011 by Kim Galizio. Kim! Kim! Hey Kim! Hey Kim! Kim! It’s your wonderful sister in-law! Here I am! Here I am! Gimmie an S, S. Gimmie an A, A. Gimmie an L, L. ( Arms making the letter L.) Gimmie an M, M. Gimmie an O,O. Gimmie a N, N. What’s that spell. SALMON!!! ( Foot kicking , touching toe.) Gooooooo, Salmon! Well even through the blog I can see that you still haven’t lost it after all these years. Interpret that how you wish. On a serious note that rub is the best thanks. If you need an idea for Christmas? That all looks sooooo good. I can never get enough of the combination of spicy flavors with lime. Now I’m hungry. I really like this rub it is on the hot side but we have not made salmon any other way since I have tried it.